Although I’m fairly young compared to the major luminaries in the tech world, I still remember when 10 gigabytes was a huge amount of disk space, but my how times have changed. But According to Cisco, times are soon to change again. For by 2015, Cisco has declared that the ‘zettabyte era’ we be brought into existence. 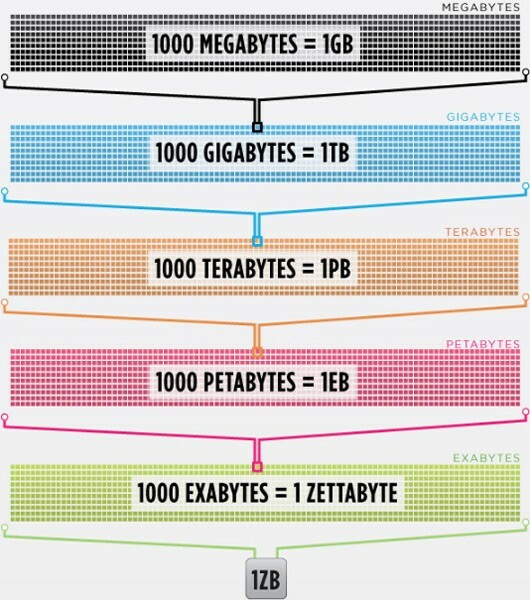 Now for those who don’t know what a zettabyte is, hopefully the above infographic will give you some sort of idea. But for those who do know, that is a whole lotta space for a consumer to use up. And upon further examination, a zettabyte is a far cry from the terabyte storage spectrum we’re used to. So what do you think? Are we ready for zettabyte storage? Is 2015 a realistic date for massive storage? It should be 1024, but I think for n00bs’ sake they put 1000.